HUGE thank you to all those that supported Tour des Trees this year. Your donations totaling over $1000, words of encouragement, training ride company, and tips all meant so much to me. Together, we raised $327,000 for the TREE Fund’s work with tree research and education across the country. It certainly is (tree)teamwork that makes it all possible.Thank you for being part of the OneTreeLove team! It was a treemendous pleasure to participate in the first half the tour as it rolled through Ohio. It was the first time in the 26 years of the tour history that it came through Ohio. And it was more than a bike ride! Overall, 71 riders participated in the 580-mile tour, as well as participated in 5 yoga classes, planted 11 trees, dedicated 17 trees, and delivered 9 Professor Pricklethron programs. You can join the treerrific fun next year as the tour goes through Tennessee and Kentucky in September 2019. Don’t want to ride? Be a virtual rider and donation to the OneTreeLove TREE Fund fundraisers throughout the rest of 2018 and 2019. Join us Saturday, Aug 25, 2018 to celebrate with a picnic! Get in touch with nature, yourself, and a community of yogAdventurers. Spend 2 nights under the trees and stars at Headwaters’ edge (that is Headwaters of the Cuyahoga River). Take part in some group or solo yogAdventures, options include: hike, bike, run, paddle, volunteer service, meditate, rest, vision, connect, and stretch. Saturday, May 19 is River Day— a regional day of celebration and service for the Cuyahoga River that is a river that sparked national attention around clean water internationally. Join us to connect with this amazing natural resource that brings life and hope to so many. This is a community co-lead adventure- meaning the final agenda will take shape once the group is all together. Lisa Meranti of OneTreeLove will be your co-leader as well as other members of NEO Ladies Adventure Group. Group size is limited to 12 members of NEO Ladies Adventure Group and guests (must be at least 18 years old; younger with full guardian supervision). No prior experience with any activities needed, all experience levels welcome. Headwaters Park camping details: Campsites are primitive, meaning no running water, electric, or trash receptacles. One tent per site with up to 4 adventurers. Vault style restrooms are available nearby. Alcohol not permitted in the camp area. Drinking water: There is a water spigot within walking distance and the water is tested and passed OH EPA drinking water standards. However, the water source may contain minerals or rust. It is recommended that campers bring their own water for drinking and sanitation. Meals: Let’s all share our favorite camping foods. Group meals will take place at campsite, nearby shelter, or boathouse. Everyone is welcome to bring food to contribution to group meals or solo food to enjoy in company together. 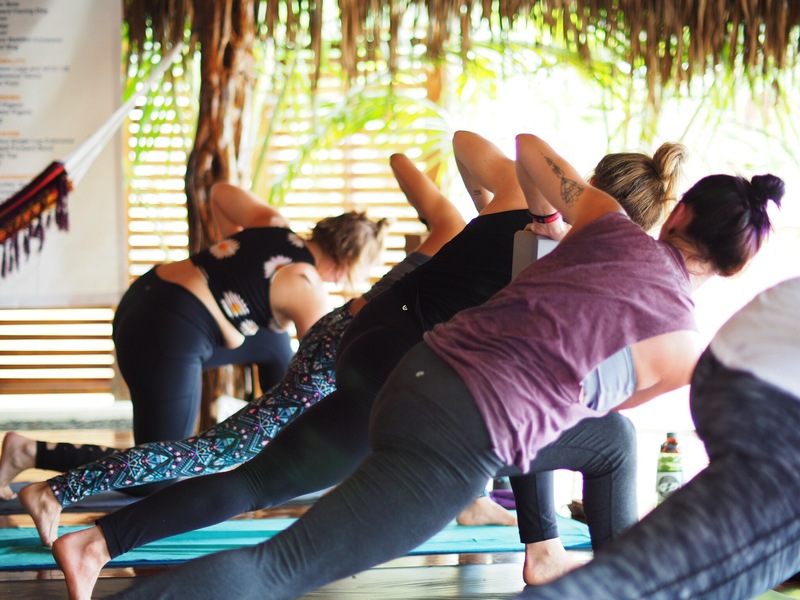 Join Lisa of OneTreeLove and Maria Santoferraro of Daily Downward Dog for a fun-filled week in Cambutal, Panama of yoga, paddle boarding, surfing, kayaking, hiking, and biking. 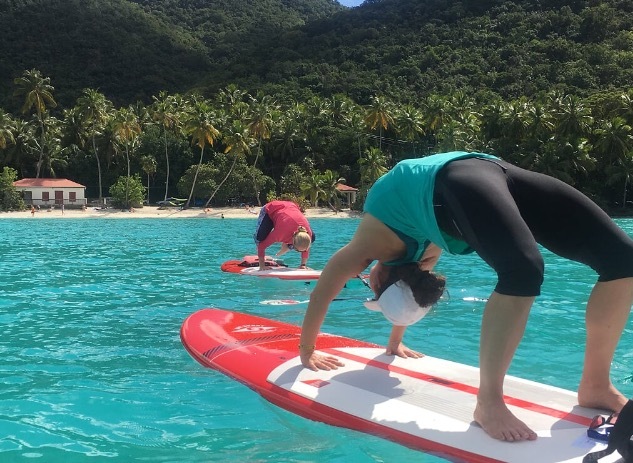 Calling all adventurous women: Join Lisa Meranti and Stephanie Jain of OneTreeLove for a special YogAdventure on St. John, U.S. Virgin Islands! St. John is known for its unique ecology, culture, spectacular beaches, and Virgin Islands National Park covering about 60% of the island. It is a magical place to challenge yourself physically, mentally, and emotionally in a small community of up to 8 women. Each day, you will have the option to participate in guided group adventures (or choose a solo adventure, if that’s what you need). Greet the morning with an energizing yoga practice, and set an intention to mindfully nudge your edges. Nourish your body with healthy meals. Transcend your self-perceived limits by hiking winding trails, snorkeling with sea turtles, and paddling pristine waters. Test your balance with standup paddleboard (SUP) yoga. Explore the island’s unique past and present at Cinnamon Bay. Learn from locals about the challenges and rewards of life on St. John. Give back by volunteering for Virgin Islands National Park. Unwind with a restorative yoga practice at the end of the day’s adventures. Process the experience with a supportive community of 8 inspiring women. When you return home, you will meet life’s adventures with new perspective. Airfare to St Thomas (STT), ferry (Red Hook, St Thomas to Cruz Bay, St John), gratuities, snorkel gear, snacks, beverages besides water and tea, and travel insurance (highly recommended) are not included. Take the leap by completing the registration application! Deposit: A $500 per person non-refundable deposit is needed to reserve your spot once your applications is accepted. Deposit can be paid by mailing a check (OneTreeLove, LLC, PO Box 114, Peninsula, Ohio 44264) or electronic transfer (link will be emailed to you). To lock in the early bird pricing, deposits are due by September 22, 2017 (last day of summer). All final balances are due no later than January 5, 2018. Please read the terms and conditions before sending your deposit. View 2017 YogAdventure photos on Facebook and read a 2017 participant’s reflections on our website!